Science and technology in Flanders, being the Flemish Community and more specifically the northern region of Belgium (Europe), is well developed with the presence of several universities and research institutes. 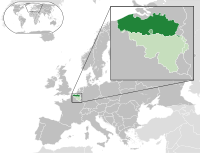 These are strongly spread over all Flemish cities, from Kortrijk and Bruges in the Western side, over Ghent as a major university center alongside Antwerp, Brussels and Leuven to Hasselt and Diepenbeek in the Eastern side. According to the Webometrics Ranking of World Universities and the THES - QS World University Rankings, four Flemish universities (Universiteit Antwerpen, Vrije Universiteit Brussel, Universiteit Gent and Katholieke Universiteit Leuven) are among the top-150 universities in Europe and top-300 universities worldwide. Vlerick Leuven Gent Management School (Leuven, Ghent): MBA and other management degrees taught in English and Dutch. Flanders is home to several science and technology institutes. This page was last edited on 15 June 2018, at 22:05 (UTC).